← Aw, aren’t they cute? 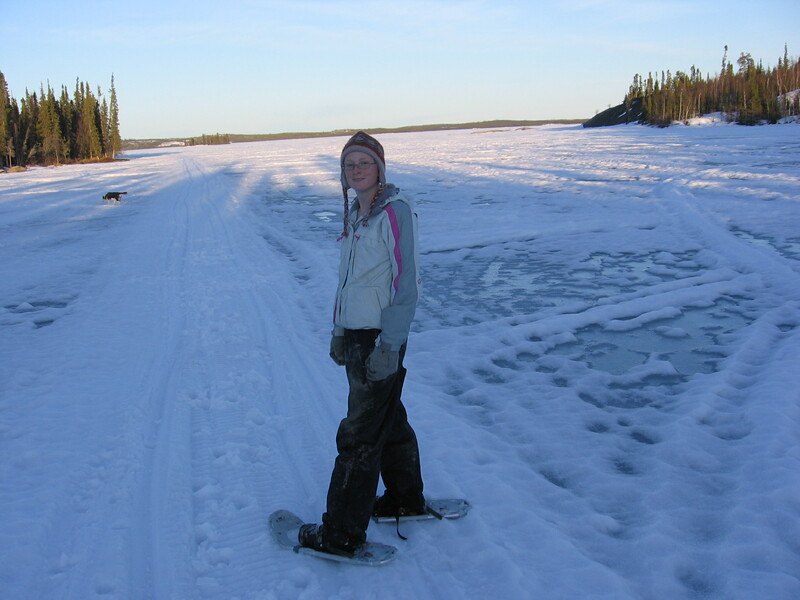 It is hard to believe that nine years ago this April I made the move to Alaska with my dogs. The first step was to get my kennel of 40 sled dogs, four puppies and one neurotic Border Collie cross from the remote fly-in lodge where I had lived and worked to Yellowknife. Flying them was out of the question – too spendy and a logistical nightmare. 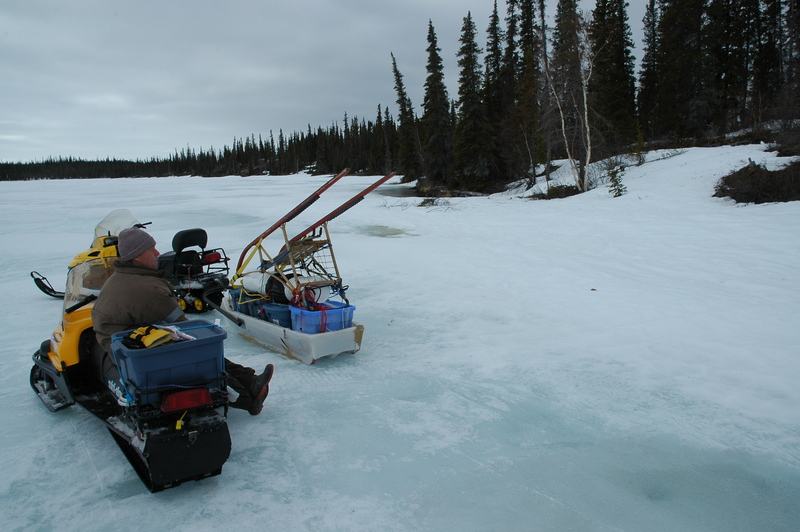 I had driven a dog team from Yellowknife to the lodge almost two years before and wanted to do the same thing on the way out. The tricky thing was that my kennel had increased in numbers so I mentioned my dogsledding idea to Tim, James, Joc and Andy – my fellow lodge co-workers – and they agreed to help me. I packed up all my worldly possessions I wouldn’t need on the trip into a dozen Rubbermaid totes and sent them, 4 puppies and my old Scotty dog on the last plane out from the lodge to town. The puppies were too young and Scotty was too old to make the trip so they were going to stay with friends. And then it warmed up. And warmed up. And warmed up. 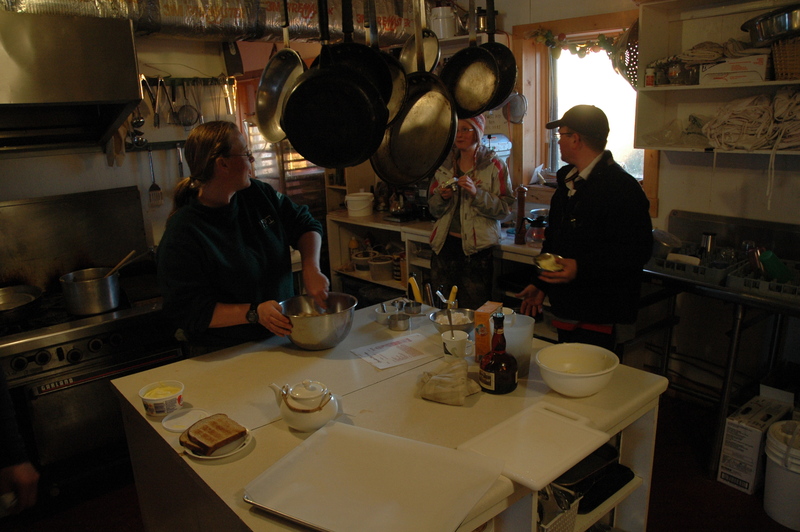 What do you do at a lodge in the middle of nowhere while you wait for the trail to firm up….make cookies!!! The view from the lodge at the lake we would have to cross. 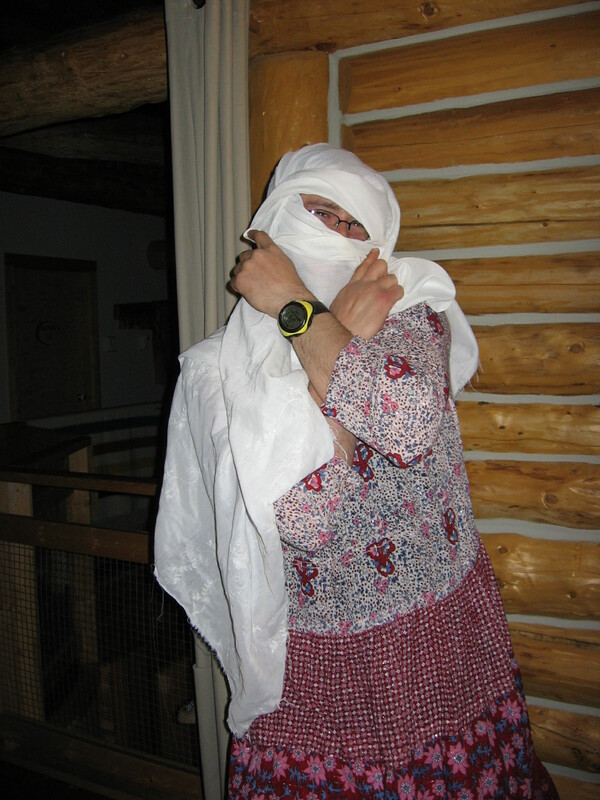 Things got a little out of control while we had to wait for trail conditions to improve! 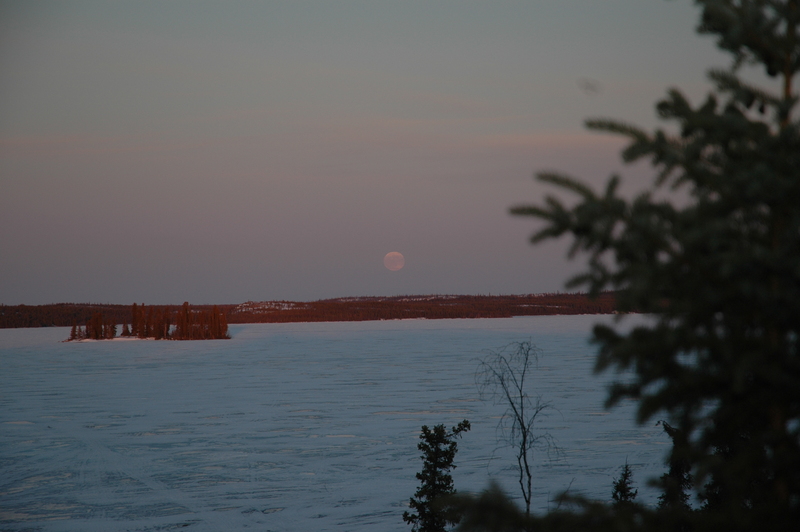 James and I took snowmachines and some some gear out to the place we first planned to camp – on the edge of the east arm of Great Slave Lake. 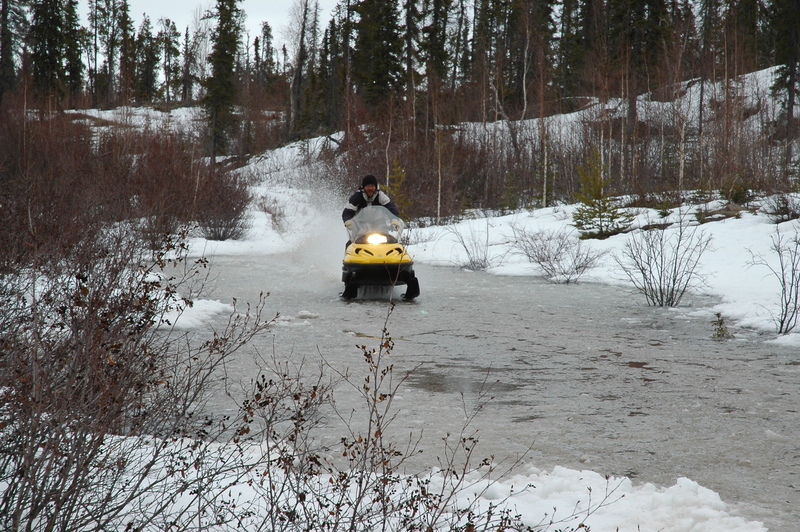 It was unusually warm for spring and the trail was soft with lots of melting snow and overflow on the ponds. 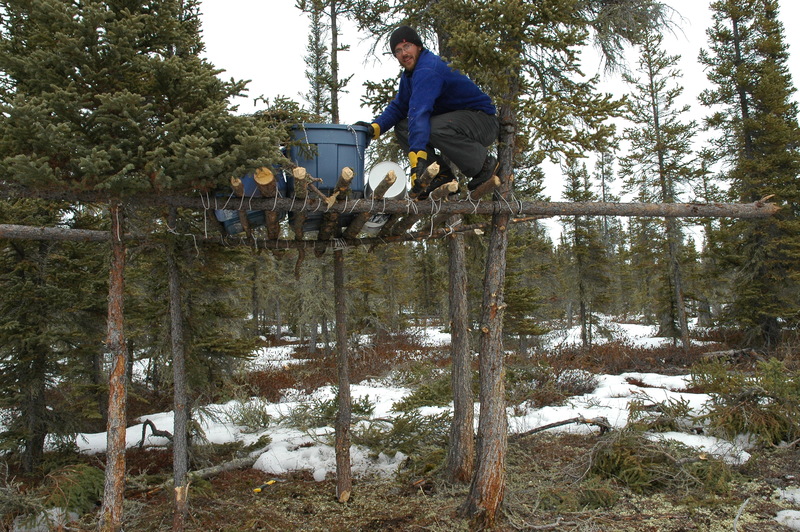 We built a cache to keep our supplies safe from the locals (moose, vermin, spring bears) and headed back to the lodge. Stopping for a break at an abandoned mine on the way to the first camp. 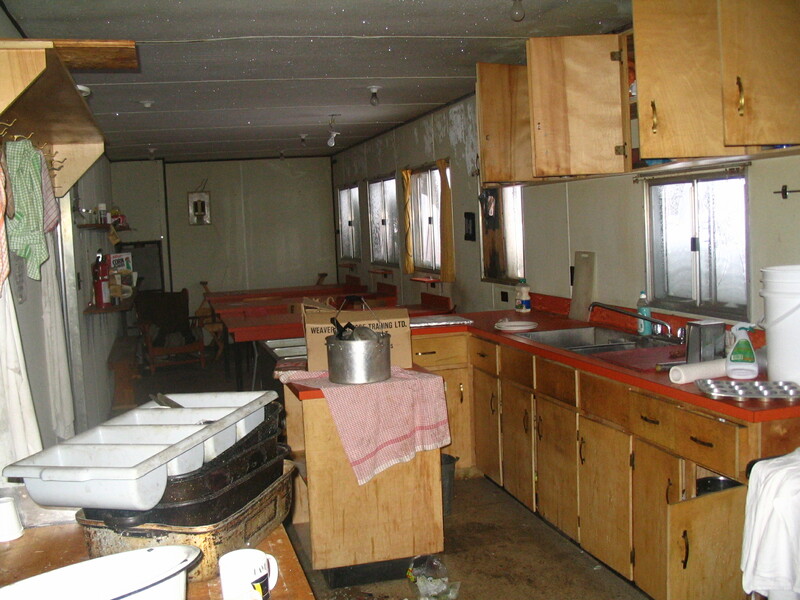 This is the kitchen at the abandoned mine. There was still food in pans and on plates. In the rooms the sheets and blankets were rumpled and clothes were in closets. The place to build the first cache. Note the lack of snow – we brought dog teams through here the next day! And yes that is James with his moose antler! James storing our goods in the cache. We crossed this part of the trail the next day. It had just enough of a skim of ice that nobody got wet! “Well we were supposed to be on our way six days ago. First was the screw up with First Air and the puppies. (An over eager counter agent declared the pups abandoned when my friend was 20 minutes late meeting the flight. I had clearly marked a number of phone numbers on their kennels but the agent called the SPCA which was the local vet – a horrible man. It was finally straightened out but not before the pups were exposed to parvo virus.) And then five days of warm temps and long hours of sunlight! It was amazing and disheartening to sit and watch the snow melt. But the temps have dropped and we sort of started the trip today. How much water is on that trail Joc? 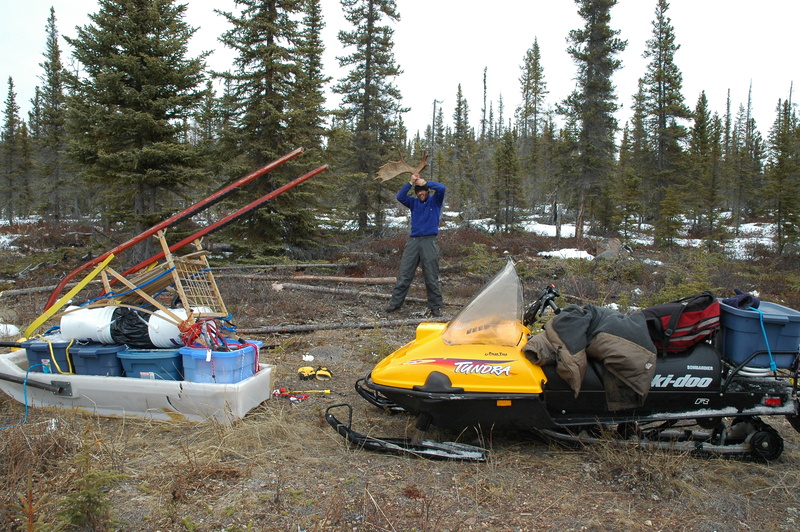 “James and I went to sit up the picket line (a kind of tie out line for the dogs to rest at) and then built a cache on Great Slave Lake. We basically checked out the trail. There is little snow on much of the portages, huge amounts of overflow on and off the portages and just about the trickiest piece of dogsledding I’ve ever seen. Should be interesting – if we live we will have many stories to tell! The trip out to the first camp site the next day was just ten miles. It gave us a chance to do all the last minute packing that always happens before a trip and to get a later. And what a start it would be! P.S. Pictures courtesy of James Gill….thanks James!!!! 2 Responses to Northwest to Alaska! Excellent post Peg and love all of the pictures. In the photo of the lodge kitchen making cookies I noticed the bottle of Grand Marnier on the isle counter is it for the cookies or is it to keep the cook/baker happy. Grand Marnier is expensive but it is quite good. LOL….I wondered if anyone would notice the bottle! Truth be told it was for the cook and the cookies!